A little while ago I surveyed a small group of trusted blogger friends and asked them to provide ten don’t-miss-if-you’re-in-New-York desserts. The guidelines were to exclude pricey “fancy pants” restaurant desserts but to include everything else. One of the items that came up was Cha-An’s black sesame creme brulee. The Japanese tea-house experience is really unique. It reminds me of tapas with many small portions of different foods. Cha-An has an al a carte menu but all the regulars told me to order one of the box specials that comes with a few small dishes, a specialty drink or tea and a special plated dessert. You can also order a tasting that only includes desserts. These are designed to be ordered with tea and shared. The desserts from Cha-An are first rate. All three were well thought out, fresh and pleasing to the eye. 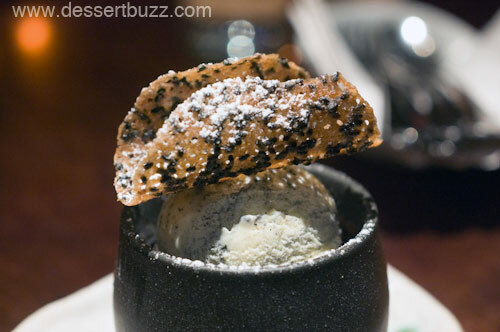 By far the best was the black sesame creme brulee with black sesame ice cream. It was super smooth and had a very strong sesame flavor. It also arrived at the table in a beautiful ceramic cup. 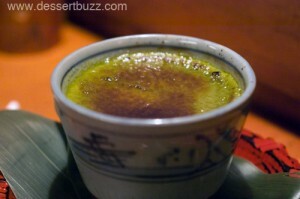 If you’re a fan of creme brulee it’s definitely worth a special trip to Cha-An for this dessert. If you do go to Cha-An just for the black sesame creme brulee, don’t forget to cross the street to Soba-Ya to try the green tea creme brulee. The other desserts were also very good. The black tea strawberry daquoise features two almond-flour-based cookies with strawberries with sweet creme inside. 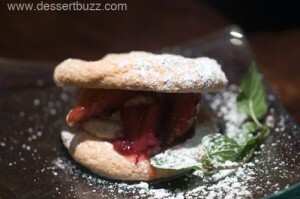 The cookies were fresh and soft and the strawberries were perfectly ripe. 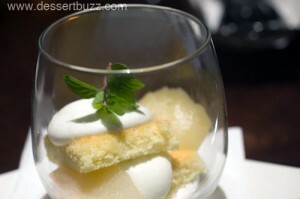 The poached pear dessert dessert comes in a glass with sponge cake pieces and whipped cream. Recommended: Black sesame creme brulee Cha-An also gets raves on Yelp. Cha-An is located at 230 East 9th Street. Their website is here. The City Sweet Tooth » Sweet Links of the Week – September 16th!